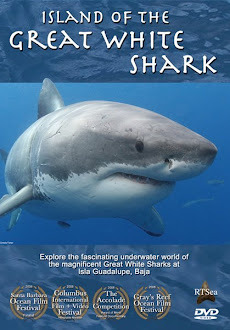 Shark Diver : Shark Diving : Swimming With Sharks: Who is more aggressive, a Bull Shark or a Great White? Who is more aggressive, a Bull Shark or a Great White? We hear a lot about how aggressive shark are. Some people think that if they encounter a shark in the ocean, they will get bit. This kind of thinking is at least partially fueled by the media that seems to portray any encounter with a shark as a near death experience. 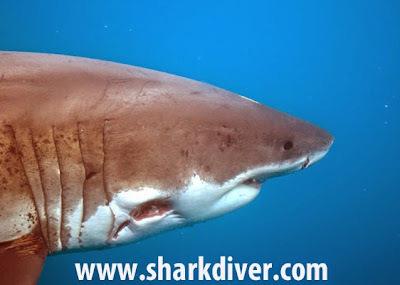 I've been diving with Great White, Bull and Tiger Sharks for over 15 years now and have found that most sharks are actually pretty shy and not very aggressive. Despite the fact that shark bites and attacks are extremely rare, the common perception is that they are dangerous. When it comes to what species is most dangerous, people tell me that because they have more testosterone than any other shark, Bull Sharks are the most aggressive and therefore the most dangerous to humans. 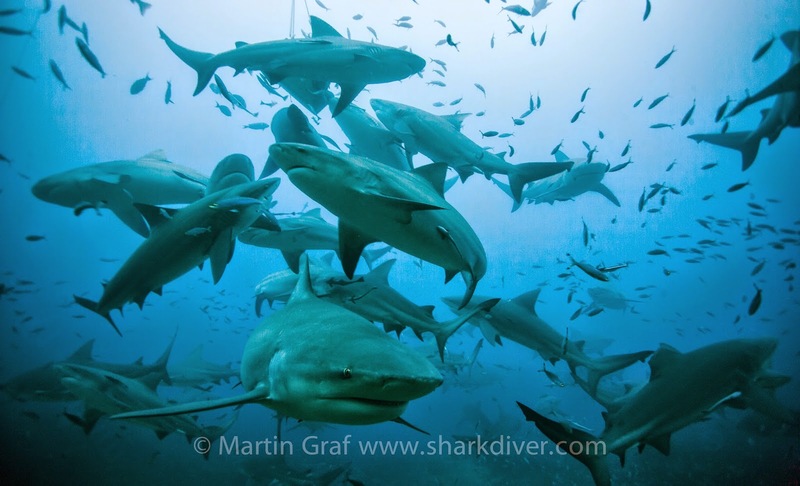 It is true, that since Bull Sharks can swim and hunt in very shallow, brackish and even fresh water, they tend to be in much closer proximity to humans than Tiger or Great White Sharks. This obviously leads to a greater chance of an encounter with them, which can result in an occasional bite or attack. Such bites however remain extremely rare. Last year there were 96 shark bites with 6 fatalities reported worldwide. These numbers include all species of shark. I think that a lot of people confuse feeding with aggression. Biting that is related to hunting or feeding has nothing to do with the testosterone level, but is simply and indication that the shark is hungry. Aggression has to do with defending their territory, establishing dominance and is usually directed toward another shark or a perceived competitor. So if we look at it that way, who is more aggressive, the Bull Shark, or the Great White Shark? Well, let me show you a couple of pictures. These pictures all show Great White Sharks with bite marks from their own kind. It is rare to see an adult Great White Shark that doesn't have some kind of scar or fresh bite mark on them. These sharks are very much into keeping their "personal space" and it is rare for them to touch each other, without there being some biting involved. Typically when 2 White Sharks encounter each other, they pass each other head on, to establish who is bigger. If that doesn't settle it, they tend to come back together and swim parallel with each other, to get a closer look. Now if that still doesn't settle it, the more dominant sharks usually shows the other who's boss by biting it on the head or in the gill area. Now I want to stress that the aggression I have observed on White Sharks is shown towards other shark and not humans, or other animals in the ocean. Just like any other "dangerous" shark, they are not very likely to attack a human. 2 of these sharks just got a tuna head, they show no aggression. In the pictures above, you can see lot's of Bull Sharks swimming very close together and there doesn't seem to be any aggression. I've seen over 70 of those sharks, without noticing any that had bite marks on them. This is something that definitely can't be said about Great Whites. 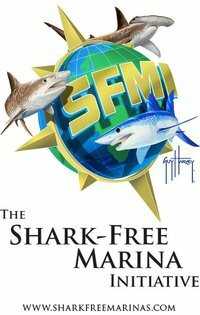 It never ceases to amaze me, how little we know about sharks and how much of what we "know" is actually wrong. We tend to think that something like testosterone will have the same effect in sharks as it does in humans. On the flip side of the "sharks are mindless killer" attitude, there is the "sharks want to be hugged" crowd, that is trying to show how harmless these sharks are by riding, grabbing, flipping and hugging them. Let's appreciate the sharks for who and what they are. They are not mindless killers, but neither are they harmless pets. As I always say, "I absolutely love "my" sharks, but it is not a mutual feeling and that is perfectly fine with me". I don't feel the need to assign human emotions to them, I love em just they way they are.